Review for The Blueprint Decoded, Nothing More than Tyler Talking on a Stage. "Nothing More than Tyler Talking on a Stage." 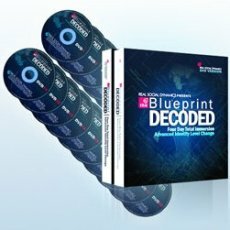 I have seen some of the BluePrint Decoded DVDs. From what I can tell, the entire DVD set is nothing more than Tyler talking on a stage. I like the whole inner game natural approach to PUA improvement taught by RSD, but if I had spent $500 on that DVD set, I would be ANGRY. Seriously. How much can you learn from sitting there watching a guy talking? I happen to be a teacher by profession, and I know darned well that lecturing is the WEAKEST form of teaching and learning. In fact, almost ZERO learning takes place during lecture. I like the Blueprint book, but the DVDs [su**].